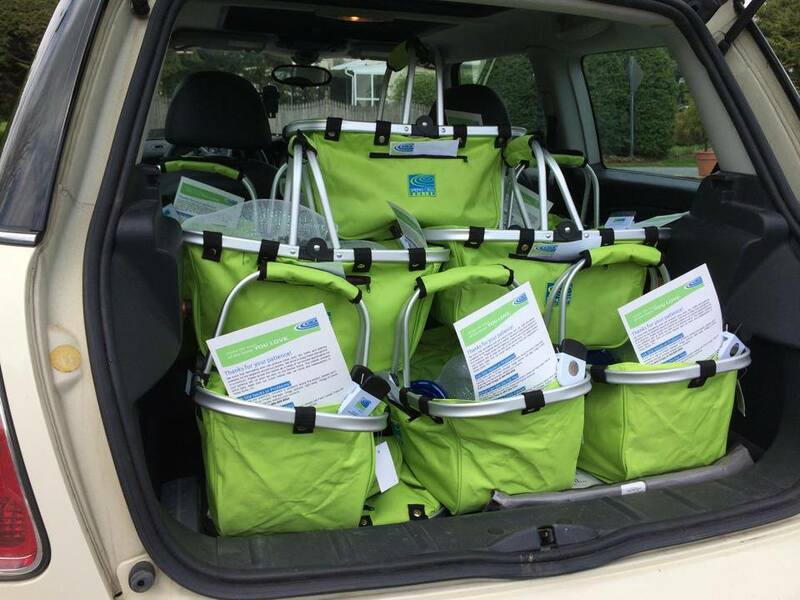 Spring Creek baskets are handed out to neighbors when work begins on a new project nearby. According to Peter Cooper, principal of the residential design/build remodeling and construction firm, the goody baskets fulfill two purposes: They serve as a marketing tool in the neighborhood the company is working in and as a client relationship tool. The company started distributing the goody baskets in 2012 as part of a larger marketing program that Spring Creek Design developed. In addition to the goody baskets during a remodeling project, the company places signage, uses vehicles with the company name on the side and mails four postcards to neighbors during the duration of a job. Cooper got the idea to deliver goody baskets through a remodeling and peer group consulting organization with which the company is affiliated. The company hands out goody baskets for almost all projects during the first week of construction. The exception is if they take a job not in their normal service radius. This note accompanies the gift basket, providing contact information for the company, in case a neighbor has job site issues. 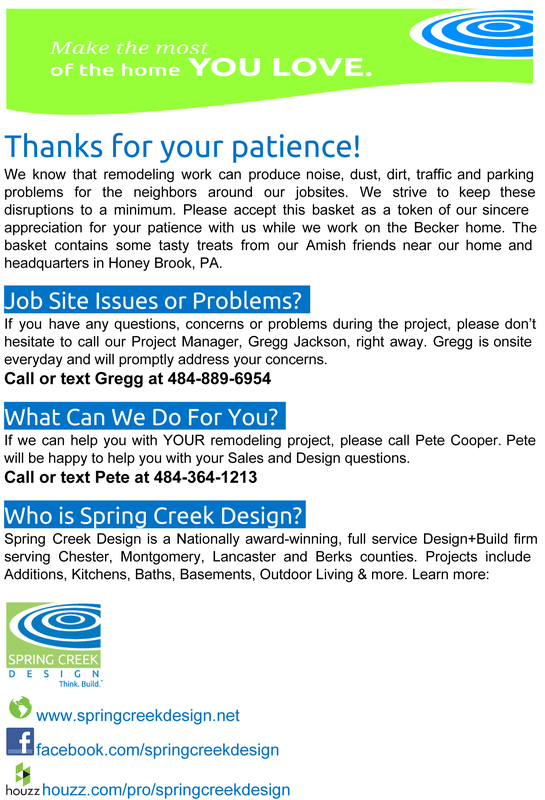 The goody baskets contain a note from Spring Creek Design, which introduces the company, provides contact information if a neighbor has any concerns or questions with the job site and essentially says thank you for putting up with the disruption during construction. In addition to the note, the basket contains up to $50 worth of items from Amish country in southeastern Pennsylvania. This includes Shoofly pies, Amish-made cheeses, jams, jellies and other items. The goody baskets are delivered by hand by Cooper and his wife Sandy. “We don’t want it to be a personally overwhelming or something we avoid doing. We want it to be manageable and fun for us—the staff that has to carry it out,” he says. The reaction to receiving a goody basket has been positive, according to Cooper. People have called and asked for a basket for a friend, posted pictures on Facebook with the baskets and mentioned the company to friends in their social circles. “They love it. … It’s a great opportunity to engage people in a friendly conversation. They are very appreciative of the baskets, and they are very happy to have contact information for our site supervisor—that makes a big difference to them,” Cooper says. Though Spring Creek Design has never received business as a result of the goody baskets, he believes it’s a great component to their marketing efforts because it helps set them apart from others. Pingback: Spring Creek Design Spring Creek Design's Goody Baskets Make the News!